It is with heavy hearts we announce the passing of Travis Donn Freysteinson. He left us on February 2, 2019 at the young age of 27. Travis’ story began on April 18, 1991. He was a child full of curiosity with a love for nature and the outdoors. As a young boy he would spend hours and hours building tree forts and BMX courses in the bushes behind the house. He loved spending his days fishing at the Forestry Farm or skateboarding at the skatepark. He was a goalie in hockey and played soccer during the summers. He achieved his black belt in Tae Kwon Do at a young age. As he got a bit older he started snowboarding and was a natural on the hill - quickly joining the provincial team. 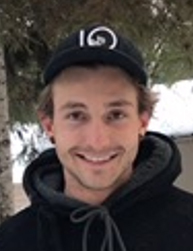 After high school, Travis spent a couple of years in Jasper living his “dream life” - snowboarding during the winter and hiking daily during the summers. His trusty sidekick Taz was with him through all these adventures. He travelled with family to Mexico, Dominican, Cuba, across Canada and to explore family roots in Iceland. Each evening while in Iceland Travis and his siblings would go hiking during the night with Travis leading the way. He completed the Boreal trail, a 120 km trail in northern Saskatchewan, four times – once in the snow. (Although Travis would never refer to it as being completed but as being experienced.) He was fearless in nature and navigated back trails effortlessly. His family always joked that he was the only one who could be dropped in the middle of nowhere and find his way out. Travis was kind. He was the type of person who was always willing to help someone out. He was the hardest worker you would ever meet, and he gave 110% in everything that he did. He worked in a variety of occupations during his lifetime – oil change technician, framer, bartender and bartending instructor, motorhand and landscaper to name a few. But his favourite position literally was being at the top of a really, tall tree. The childhood thrill of climbing trees never left him and for the last few years he ran his own business Top Notch Tree Care. Travis’ laughter was so infectious when you heard it you couldn’t help but start laughing too. But it was his smile that stole your heart, and which will always be imprinted in our memories. Travis will be forever cherished by his parents Jacqueline and Trevor Freysteinson; brother Trey Freysteinson, sister Natasha (Sean) Bryden and his niece Emma; grandmothers Angela Dodds and Lila Freysteinson; grandfather Harry Dodds; Uncle John; Uncle Murray; Auntie Wyona (Tom); Uncle Brad (Diane); Uncle Ted (Sue); and cousins AJ (Rebecca), Jordan (LaDana), Brandy, Amber (Ben), Courtney (Darin), Kyla, and TJ. He will be forever remembered by many great aunts and uncles, and extended cousins that he loved dearly. Travis was also blessed to have the most amazing friends in his journey through life. His memory will live on through their stories. Travis’ two dogs, Taz and Koda, were his heart and joy. They are lost without him. Travis was predeceased by his grandfather, Don Freysteinson. We invite you to join us in a Celebration of Travis’s Life at 1:00 p.m. on Monday, February 11, 2019 at McClure United Church (4025 Taylor St. E.) in Saskatoon to celebrate and remember all the things that made him special. Travis had a great love of animals and the outdoors and so in that spirit, in lieu of flowers, donations to charities supporting such causes would best honour his memory. Arrangements in care of John Schachtel – Mourning Glory Funeral Services (306) 978-5200.